The most unappealing thing about getting older is worry. Not wrinkles, not weight gain, not balding or losing control of your bowels.... it's worry. It's the one important thing that people neglect to mention. As we grow and age we become more aware and more wise (in some cases), but this awareness makes me itch sometimes. Knowing too much can be a curse. Children are ignorant and free - it is beautiful. But money, work and all sorts of responsibility makes us so serious and contemplative and full of stress. If someone finds the magic equation for a balance of child-like freedom with worry-free addulthood, sign me up for those math classes! For now I have baking and cookies to make everything just fine. 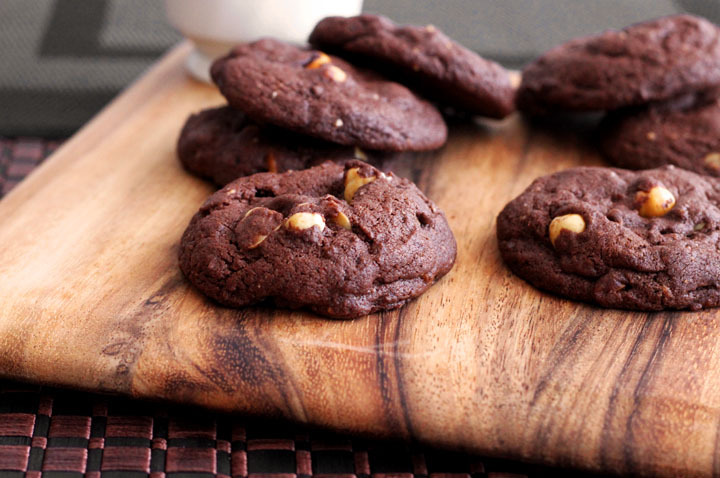 Chocolate and hazelnut is almost as popular on this blog as chocolate and peanut butter. 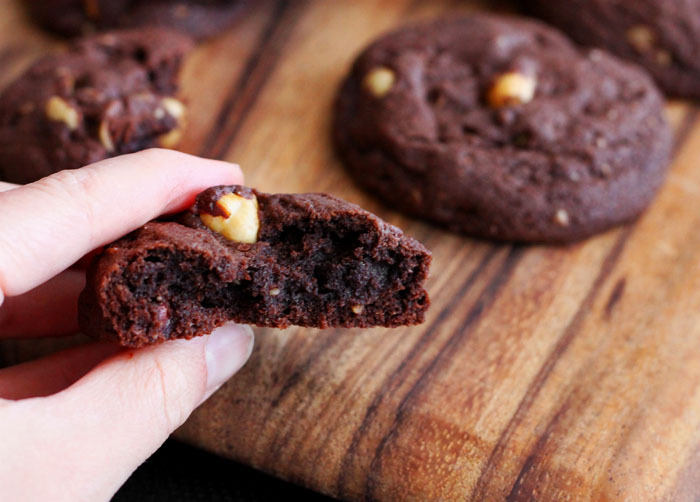 These cookies are super thick and super fudgy, the way I like most cookies. This recipe offers a double dose of all the good stuff. Melted milk chocolate follows the lightly creamed butter and sugar, and three tablespoons of cocoa powder bump up the chocolate flavour. Milk chocolate is wonderful with hazelnuts thanks to the creamy dairy notes that accompany it, but the added earthyness and bitterness of cocoa is necessary to balance its sweetness. 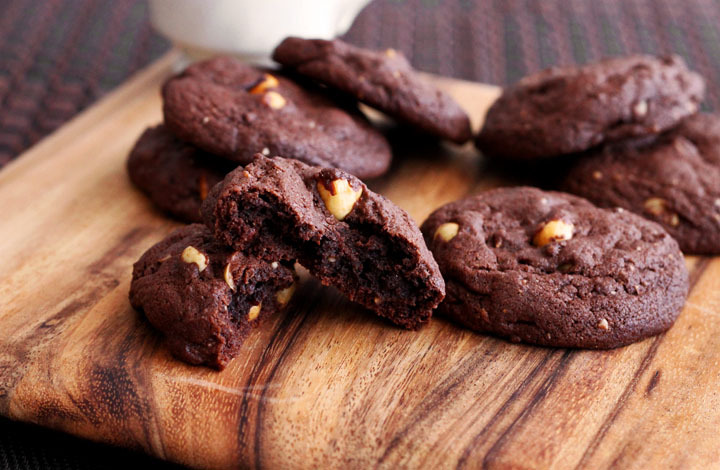 These milk solids also add body and structure to help with the thick and fudgy business. Top Tip: for soft, fudgy cookies don't cream the butter and sugar to oblivion - it should be well blended but still look a tad grainy. For crisp cookies, cream and cream away. There's also twice the nuttiness: ground hazelnuts (hazelnut meal) mixed right into the dough with the flour and other dry stuff as well as whole roasted hazelnuts for mucho crunch. Please roast or toast the nuts. Pleeeeease! They're not even worth putting in if they aren't toasty in some way or another. See, this is where worry sets in... I stress about you being deprived of Maillard Browning reaction flavours... it makes me crazy. I'm getting old and weird like that. It only takes about 8 minutes in a moderate oven, or over a medium-low flame in a dry frying pan. Easy. Worth it. Cream butter and brown sugar until smooth but still grainy – no need for light and fluffy here. Beat in melted milk chocolate. Add egg and salt and beat until well combined. Place flour in a separate bowl and then sift in cocoa and baking soda. Whisk to blend evenly and then fold into the butter mixture with the ground hazelnuts. Fold in roasted hazelnuts. Cover dough with plastic wrap and refrigerate for 1 hour. Scoop about 2 tablespoons of dough onto baking tray, spacing them 2-3 inches apart. Bake for 9-12 minutes or until dry-looking but not crisp (they should still be a bit soft in the center). Transfer pan to a wire rack and let cool for a minute on the pan before transferring individually to the rack to cool completely. 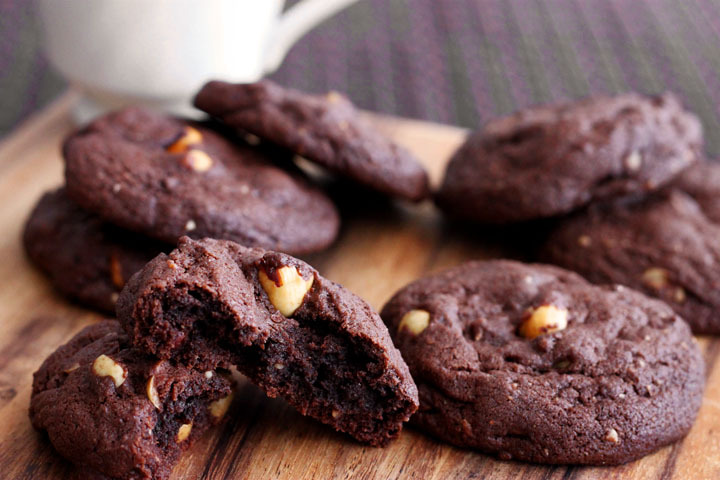 Milk Chocolate Fudge Hazelnut Cookies are my all time favorite cookies.I can't resist myself from eating it even in my dieting days.I will surely try to make it at home.